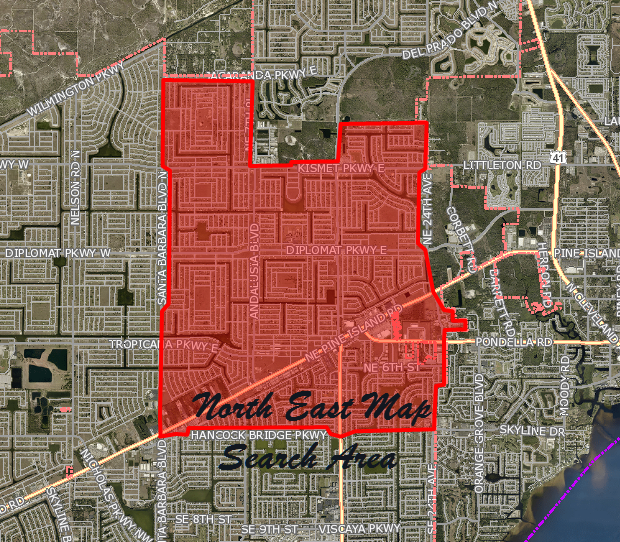 NE Cape Coral has lots of room to expand and grow for future building. With the large canal system throughout Cape Coral there is an abundance of fresh water lots to build on. This area is still close to shopping and major business services. The boundaries are Hancock Bridge Pkwy to the south and Jacaranda Pkwy to the north. Everything east of Santa Barbara Blvd going towards North Ft. Myers are the east and west boundary points. Fresh water lots are not required to have a seawall and sometimes you'll see homes with the rear of the property sloped down to the canal with either grass or a rock landscape design. Prices are still extremely affordable and sometimes just a little more than what an off water lot would cost. Very nice water front. BUYER TO ASSUME ANY AND ALL ASSESSMENTS. Build your dream home on this beautiful FRESH WATER lot. Conveniently located close to schools, dining & shopping. Canal front lot in Cape Coral. Excellent location close to shopping and restaurants. VERY NICE WATER FRONT WITH SOUTHERN PATIO.